From “Cross Cultural Holiday” article in the December 2017 issue. Many of Ahmed’s dishes make use of humble ingredients such as squash and beans but also layer them with complex flavors, including coconut and curry and other spices. 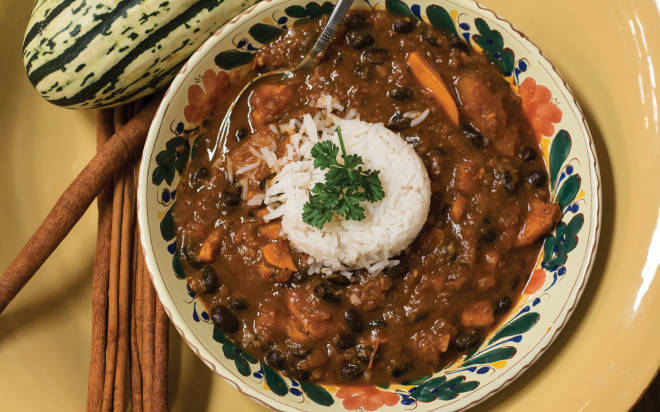 This stew is the perfect example with a simply magical taste. Ahmed served the stew over steamy white rice. 1. In a medium-size soup pot, warm olive oil over medium heat. Stir in onions, ginger, and garlic, and saute them until soft, about 5–8 minutes. Add dried spices and continue stirring 3 or 4 minutes, until spices begin to pop. Stir in tomato paste and tomatoes and cook for another 3 or 4 minutes, until a paste forms. 2. Add black beans, diced butternut squash, and stock. Bring mixture to a boil, then reduce heat, and simmer for 15–20 minutes, or until vegetables are soft. Add another ½–1 cup stock if the mixture gets dry. Mix in coconut milk, sherry, and rice wine vinegar. Cook for another 10–15 minutes. Add salt and pepper, as needed. 3. Serve hot in big bowls, over rice if you wish.